On this page you will find life stories of people who have experienced something, as a result of which their lifes have been changed drasticly. Illness, handicaps, misfortunes or other apparently dramatic incidents. It is remarkable that by them it is not seen as a misfortune, but on the contrary, as a gift to fulfill their mission in life. For the outside world a fully handicapped son with a father who has a heart condition. Together they do the most severe triathlon in the US, the Iron Man and they are an example for the world! More …. Born without arms and even without legs. It didn’t stop Nick from building an independent and happy life, and even give world-wide inspiring seminars about items like happiness, endurance and inner strength. More …. Being teased at school, could sing well but didn’t dare to do so in public. After first successes got cancer, conquered and won Idols. Now he is a well known opera singer with world fame. More …. Talented sporter. Was confronted with leukaemia. Conquered this, recovered, trained and won a gold medal with swimming in 2008. More …. Youngest world champion ever with 21 years. Tremendous will power. Got confronted after 4 years with tumors in brains and lungs and had little chance to survive. Recovered by the right medical support and the struggle that Lance entered upon against his cancer cells. As a miracle he ended up totally recovered. 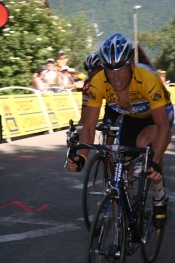 Then he won one of the most severe sporting competitions, the Tour de France, seven times in a row. After having fought for his own cancer foundation for 3 years, in 2009 Lance will return in the cycling platoon to prove that you can do more than you think after cancer, even when you are 37 years old. This to generate world wide publicity for his foundation. More ….